Well, this is hardly news anymore, but Moscow's stock markets were closed again this morning. The news will obviously be in future when they are open. Russia's Micex Stock Exchange and RTS suspended trading this morning because their "technical indexes'' a measure of aggregate stock prices, fell more than 10 percent on opening. Russian global depositary receipts plunged in London trading following the decision, led by steelmakers. The FTSE Russia IOB Index, a measure of Russian depositary receipts trading in London, sank 11 percent to 312.83 at 9:36 a.m. in London, the lowest in almost five years. OAO Severstal, Russia's biggest steelmaker, fell 23 percent to $2.50. Evraz Group SA, the second-largest steelmaker, dropped 15 percent to $10.60, or 92 percent below its May 16 high. The ruble fell to an 18-month low against the dollar this morning even while it strengthened for a second straight day versus an ever weaker euro. The currency, which policy makers manage against a dollar- euro basket in an attempt to protect the competitiveness of exporters, fell as much as 0.6 percent to 27.3738 per dollar, the weakest since April 2006. 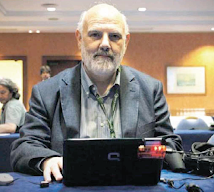 It was at 27.3624 by 11:01 a.m. in Moscow, from 27.1991 late on Oct. 24. The ruble jumped 0.9 percent to 34.0292 per euro, the strongest in almost two years. Bank Rossii, Russia's central bank, buys and sells foreign currency reserves to keep the ruble within a trading band against the basket. The basket rate is calculated by multiplying the ruble's rate to the dollar by 0.55, the euro rate by 0.45, then adding them together. Russia's currency was little changed at 30.3757 against the basket, from 30.4096 at the end of last week, when it strengthened just 0.1 percent. The 30.40 level is regarded by most analysts as the weakest end of the central bank's trading band. Bank Rossii sold almost $11 billion supporting the ruble against the basket last week, according to estimates by Moscow's MDM Bank. Crude oil, Russia's biggest export earner, fell for a second day, extending its decline from a July 11 record of $142.27 to 57 percent. Urals crude, the nation's main export blend, slid 10 percent last week to $59.93, below the $70 average. Russia's long-term sovereign credit rating outlook was lowered yesterday (Thursday) - to negative - by Standard & Poor's Ratings Services due to their assessment that the cost of the government's "bank rescue operation'' may increase. S&P cut their outlook from stable, a move which reflects the increased probability of a downgrade at some point in the future. Russia has committed as much as 15 percent of gross domestic product in budgetary and reserve funds to maintain banking liquidity, according to calculations made by the rating agency. At the same time S&P affirmed Russia's BBB+ long-term foreign currency and the A- long-term local currency ratings and the short-term ratings of A-2. debtors' access to official funds will vary,'' S&P said in the statement. Russia's reserves fell $14.9 billion last week to $515.7 billion according to the latest data from the central bank. This was the third straight week of decline, and the fall comes after the central bank sold foreign currency to prop up the ruble. Obviously there are plenty of reserves left, but this is down from around $550 billion in August, so it can't go on forever, either. The ruble weakened yesterday by as much as 0.5 percent to hit 27.0664 to the dollar at one point, the lowest since July 2006. It later rebounded and was 0.1 percent lower on the day at 26.9538 at the close in Moscow. Russian government bonds fell, with the yield on the 7.5 percent bond due 2030 rising 8 basis points to 10.94 percent, the highest for more than six years. The 12.75 percent bond maturing 2028 yielded 10.56 percent, up 84 basis points to a six-year high. The yield on the 11 percent bond due 2018 jumped 93 points to 8 percent, the most since 2004. Russia's Micex Stock Exchange slid again today, and suspended trading at 2:10 p.m. until next week. The next session will start on October 28, but with the Russian bourses now closed almost as often as they are open, it is hard to be sure about anything at this point. The so-called technical index fell more than 10 percent, triggering the halt, according to information available on the stock exchange Web site. Russian stocks dropped for a third day, led by banks, on concern the turmoil in the country's equity markets is spreading to bonds and the ruble. OAO Sperbank, Russia's largestest bank, slid 15 percent and VTB Group, the second-largest, dropped 3.9 percent following a decline in Asian financial stocks. OAO Rosneft tumbled 9.4 percent as oil fell. Crude dropped 1.7 percent to $69.68 a barrel in New York trading yesterday, after slumping 4.5 percent on Wednesday. Urals crude, Russia's export blend, fell 4.3 percent to $66.16 a barrel. Urals needs to average $70 a barrel next year for the country's budget to balance, according to the Finance Ministry. Russia's government will decide "within days'' on how to help developers and reassure banks on loans for the building industry during an economic slowdown, according to Arkady Dvorkovich, an economic aide to President Dmitry Medvedev. Construction, agriculture, machine-tools building and retail are the non-financial industries the government plans to boost, along with small businesses across the economy. Dvorkovich told reporters that the Russian government is discussing two possible mechanisms to help reassure banks vis a vis their lending to construction companies. The government may offer to buy unsold apartments at a fixed price in residential buildings that are still under construction, once the buildings are completed. Another possibility is that the OAO Agency for Housing Mortgage Lending, the state-run mortgage agency, will refinance loans once construction of a residential building is completed. Finance Minister Alexei Kudrin said earlier in the week that Russia's "overheated'' construction industry is facing difficult times,. Bank loans to construction companies increased 80 percent last year, compared with a 64 percent increase in borrowing for real-estate purchases, a sign that developers are over-building, according to Kudrin. Soyuzcement, an industry group, have reported that cement producers are reducing plans for new factories as the credit crunch derails construction projects, while companies in industrial and services sectors right across the Russian economy are cutting back on jobs and investments. Russian state revenue will more than likely fall sharply as the price of oil, the country's biggest export, plunges and capital flight accelerates on concern the global economy will enter a recession. Russian companies and banks have applied for almost $100 billion of loans from state development bank Vnesheconombank to refinance foreign debt after credit markets worldwide seized up, threatening economic growth. Banks have asked for $64 billion, while companies have requested $33 billion, according to bank Chairman Vladimir Dmitriev. The bank's supervisory board plans to review the first 10 projects, from commodities and manufacturing companies, "in the near future". Prime Minister Vladimir Putin is chairman of the bank board. Russia's government allocated $50 billion to Vnesheconombank, or VEB, as part of a more than $200 billion package to stem the country's worst financial crisis since 1998. Companies can apply for loans of between $100 million and $2.5 billion, Dmitriev said Oct. 13. Vnesheconombank will receive rescue funds after reviewing applications, Dmitriev said today. Russian companies may default on almost a third of local-currency bonds as soaring borrowing costs make it "impossible'' to refinance the debt, according to Denis Gaevski, head of capital markets at Bank of Moscow, which the third-biggest arranger of ruble bonds. Companies may default on between 20 and 30 percent of the bonds, with retailers particularly vulnerable, he said. Russian companies are estimated to have sold 406 billion rubles ($15.2 billion) of bonds this year, with almost all of the sales taking place before August, when Russia's invasion of Georgia triggered an investor exodus during which around $63 billion have left the country, according to a UniCredit estimate. The average price of ruble-denominated corporate debt dropped to an all-time low of 86 percent of face value on Wednesday, from more than 100 percent in June, according to the MICEXCBI index of bonds traded on Moscow's Micex Stock Exchange. Bonds payable in 2009 by Moscow-based property developer Mirax Group traded for as little as 30 percent earlier this month, and were priced at 54 percent of face value in the middle of this week. The average interest rate Russian banks charge to lend money to each other overnight - the so called MosPrime rate - oreached a record 21 percent last week, but was back down to 7.67 percent yesterday. Slumping commodities prices, the war with Georgia and the seizing up of global capital markets prompted investors to pull money out of Russia, despite the best efforst of the Russian government to restore confidence and to inject money into the system to brake the slowdown. Last month the Russian government has pledged more than $200 billion for banks and companies to stem the worst financial crisis since 1998. Russia's government plans to lend the country's biggest banks 950 billion rubles ($36 billion) for at least five years in an attempt to unfreeze credit markets, according to a new plan announced by President Dmitry Medvedev this morning. State-run OAO Sberbank and VTB Group, will get 500 billion rubles and 200 billion rubles respectively. Some 450 billion roubles ($17.19 billion) of the 950 billion rouble subordinate loans package for banks will come from one of the National Wealth Funds according to Finance Minister Alexei Kudrin said on Tuesday. Russia's two oil wealth funds totalled $189.7 billion as of Oct. 1. The Russian authorities, who are currently grappling with the worst financial crisis since the government's debt default in 1998, have already pledged more than $150 billion for banks and companies through loans and tax benefits (see details in this post here). Russian stocks rose following the announcement, and with OAO Sberbank and VTB Group leading the advance. OAO Rosneft, Russia's biggest oil producer, pared back some of yesterday's 24 percent decline after crude rose in New York. The Micex Index initially gained 5.7 percent to 794.48 at 2:12 p.m. in Moscow, after falling 19 percent yesterday. The dollar- denominated RTS Index climbed 4 percent to 900.60 after retreating 19 percent yesterday, the biggest slump since the index began in 1995. However the good news was not to last long, and it seems the plan wasn't enough to convince investors the government can halt its worst financial crisis since 1998. On the day the Micex Index fell 4.5 percent to 717.83, after losing 19 percent yesterday, and closed at its lowest level since August 2005. Share trading on Russia's bourses had earlier been suspended for a second day first thing this morning following yesterday's massive sell off. Russia's stock markets have now been halted nine times since Sept. 16. One indication of just how critical the situation is becoming is the fact that the MosPrime interbank rate - that is the rate that Russian banks charge to lend to each other - soared to 7.29 percent today from 4.75 percent at the end of last week. Russia's oil and gas majors were all down, with Gazprom sinking 4.9 percent to 136.10 rubles. Rosneft falling 6.6 percent to 101.87 rubles, and Lukoil declining 5.3 percent to 1,047.90 rubles. The price of oil, which has slipped 38 percent from a record $147.27 a barrel July 11, snapped a four-day decline this morning, rising 3 percent to $90.47 a barrel, and all the majors seem to have applied to the government for help with loans. Lukoil is seeking between $2 billion and $5 billion to refinance loans, but many other companies are also reported to be seeking government loans, including OAO Gazprom, OAO Rosneft, and TNK-BP, BP Plc's 50 percent Russian venture. Russia is urgently seeking to mend fences with the west after the damage done by the conflict in Georgia, amid fears that the country faces a suuden slowdwon followed by an extended period of stag­flation. According to Igor Yurgens - former vice-president and executive secretary of the Russian Union of Industrialists & Entrepreneurs, and currently an adviser to Dmitry Medvedev - the Russian administration are trying their best to send signals of an improved business climate as Russia battles to restore investor confidence, which he recognises have been badly shaken by the cold war style rhetoric of recent weeks . Mr Yurgens told the FT that a slowdown in growth because “credit lines are closed” was inevitable with a fall of as much as 4 percentage points in GDP growth from the current 8 percent level. This provisional estimate of the growth rate at the end of 2008 seems realistic to me. The head of a think tank advising the president, Igor Yurgens was pretty much a lone voice criticising Vladimir Putin this summer for his attack on Mechel, a coal and steel group, and his comments at the time was one of the factors which helped trigger the investor exodus due to concern over political risks. The government’s reining in of its rhetoric “is visible and is being substantiated by some megadeals in the pipeline and signed, such as Eon Ruhrgas”, he said, referring to last week’s deal between Eon and Gazprom. “You could feel a little bit of discontent with the hawkish rhetoric and you see the adjustment,” he said, adding that Mr Medvedev hoped to push ahead with cutting back bureaucracy and stimulating growth in the oil ­sector via tax incentives. I guess we can consider this mornings reported decision of the Russian authorities to extend a 4 billion-euro ($5.43 billion) loan to Iceland to be the kind of pacificatory measure Yurgens has in mind. Meanwhile Andrei Sharonov, managing director of Troika Dialog, the Russia's oldest investment bank, warned yesterday that the country was "quite vulnerable" to the global credit crisis and with retailers and developers being particularly at risk, while Bloomberg cite Gulzhan Moldazhanova, chief executive officer of Basic Element, the investment group of Russia's richest man, Oleg Deripaska, to the effect that Russian retailers are currently being offered credit with an interest rate of up to 35 percent. Russia's ruble fell for the eighth consecutive day yesterday, and hit its weakest level in 18 months against the dollar at 26.2043. The extra yield investors demand to own developing-nation bonds instead of U.S. Treasuries swelled 48 basis points, or 0.48 percentage point, to a four-year high of 4.85 percentage points, according to the JPMorgan Chase & Co EMBI+ index. The cost of protecting bonds sold by Russia's government jumped the most in three weeks, rising 26 basis points to 290, according to CMA Datavision in London. Credit default swaps on Ukrainian government debt also soared 57 basis points to 900, the highest among Europe's emerging markets, CMA prices show. 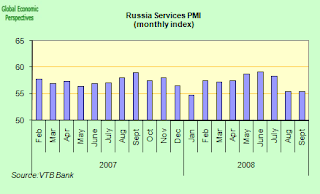 Russian service industries continue to expand, and they even did so at a slightly more rapid pace in September than in August. Evidently confidence has yet to feel the impact of recent financial developments, at least that is the conclusion which can be drawn from the latest VTB Bank Europe Purchasing Managers' Index report. According to the VTB survey growth in services rose to 55.5 from 55.4 in August. Nonetheless this was the third-lowest reading since the survey started in 2001. It is clear that the Russian services sector - and especially the financial services and real estate components - is going to slow more, and probably considerably more, and that end of year GDP growth will be down on the kind of levels we have been seeing over the last 18 months or so. How much down? I will need to see some more data from the real economy to get a "fix" on that I think. Just remember, patience IS a virtue, and better a later result than a more rapid one which is completely worthless. Mark to market, but in due course and not before. Russia's RTS Index had its worst week in nine years this week, forcing the exchange to halt trading yet one more time, as the biggest slump in commodity prices in a half century sent raw-material producers lower. OAO GMK Norilsk Nickel, Russia's biggest mining company, had a record loss on the Micex after saying first-half profit sank 33 percent. OAO Gazprom dropped the most since Sept. 16. The dollar-denominated RTS plunged 7.1 percent to 1,070.98, bringing its weekly drop to 17 percent, the biggest since 1999. Trading was halted three times this week on the RTS exchange, Russia's second-biggest bourse, because of stock declines. The ruble-denominated Micex Index lost 5.3 percent to 924.55 today. Commodities, as measured by the Reuters/Jefferies CRB Index of 19 raw materials, have tumbled 10 percent this week, the most since at least 1956. Crude oil has fallen 11 percent so far this week on declining U.S. demand and economic growth concerns. Norilsk Nickel plunged 18 percent to 2,757.57 rubles, its biggest decline since listing on the Micex last year. The world's largest producer of refined nickel said first-half profit fell to $2.7 billion from $4 billion a year earlier on lower nickel prices and higher costs. OAO Uralkali, Russia's second-biggest potash producer, sank 8.2 percent to 117.83 rubles after dropping 11 percent yesterday. Well the action in Russia this week has moved on slightly, and the damage has started to spread from pressure on the domestic stock market (accompanied by capital flight) to the real economy - via a very rapid tightening in credit conditions for Russian domestic users. We are also seeing a rapid slowdown in Russian manufacturing industry as internal demand slows while the inflation-driven decline in cost competitiveness continues to make imported products (where available) an attractive alternative to the home produced variant. Emerging-market bonds have been generally falling this week as the U.S. Senate's approval of a $700 billion bank rescue package did little to revive demand for riskier debt, and Russia has, unsurprisingly, been among the worst affected. The extra yield investors demand to own developing-nation bonds rather than U.S. Treasuries rose 8 basis points yestreday to 4.14 percentage points after widening 12 basis points on Wednesday, according to the JPMorgan Chase EMBI+ index. At the same time the MSCI Emerging Markets Index of stocks fell 0.3 percent to 783.79, its lowest point in four days. While such data readouts do not of course exclusively define the outlook for the Russian economy, they do give us a good indication of the context within which economic activity occurs, and they also give us a very clear measure of the current level of global risk sentiment whose influence, as we will see below, lies right at the heart of the immediate shock that is hitting Russian households and businesses. One indication of the slightly different panorama to be found in Russia this week - and of the way in which the recent government intervention is moving the focal point of the crisis away from the equity markets and into the credit ones - is to be found in the little detail that the dollar value of Russia's international reserves actually rose $3.4 billion last week, following consecutive declines during each of the three previous weeks, according to data released this week by Bank Rosii. The value of Russia's Forex reserves increased to $562.8 billion in the week to Sept. 26, after decreasing $900 million to $559.4 billion in the previous week. A significant decline in the value of the dollar (which only represents about 47% of the reserves basket) seems to have been behind what is really a technical revaluation - given that the effect is produced by the rest of the currencies in the basket rising in value against the dollar. But there is no doubting the fact that the capital flight has - for the time being - lost momentum, even though the central bank felt forced to sell an estimated $4.9 billion from the reserves last week to support the ruble, and an estimated $20.6 billion over the last four weeks. About 47 percent of Russia's reserves are held in U.S. dollars, 42 percent in euros, 10 percent in pounds and 1 percent in yen, according to the most recent figures released by the central bank on June 30, 2007. The share of the reserves held in Swiss francs was reported as being "insignificant''. But while the bloodletting on the foreign exchange side seems to have abated for the time being - PNB Paribas estmated that some $57 billion were taken out of the country between Aug. 8 and Sept. 19, BNP Paribas - the outlook for Russia's banking system has deteriorated significantly after been downgraded to a "negative'' rating by Moody's Investors Services last week. Slowing asset growth, higher inflation and a decline in equities may constitute as lethal cocktail which produce a sytematic deterioration in the undelying fundamental of Russian banks, is the conclusion many investors are drawing from Moody's latest "Banking System Outlook for Russia" report. Moody's main expressed concern was the way in which Russian banks hadn't cut back their lending in response to the recent change in risk sentiment, thus increasing their risk profile. The "structural weaknesses'' that surfaced this month in Russia's banking system and the possible impact of the global credit squeeze may hurt the ability of banks to repay debt and attract financing, Moody's said in the report. Both OAO Sberbank and VTB Group, Russia's biggest banks, declined following the issuing of the Moody's report. Indeed only this morning (Friday) VTB shares have fallen back one more time, after the bank announced it lost 9.31 billion rubles ($360 million) in September due to ``negative market dynamics.'' Nine-month net income for the bank (under Russian accounting standards) fell to 7.44 billion rubles from the 16.8 billion rubles in the first eight months of the year declared in August. The drop followed a "revaluation of the bank's securities portfolio,'' according to the accompanying statement. And the other main credit rating agencies have not exactly been silent, with Fitch stating earlier this month that Russian real estate and construction companies are the most at risk as domestic and international banks curb lending, while Russia's credit outlook was cut to "stable'' from "positive'' by Standard & Poor's on Sept. 19. S&P's made the point that the Russian authorities face growing pressure to spend the country's oil generated reserve funds, undermining the country's longer term credit strength. They did however maintain Russia's rating of BBB+, the third- lowest investment grade ranking. Of course the result of these downgrades (coming hard on the heels of the loss of confidence in the ability of the Russian institutional system to reform itself) wasn't hard to anticipate or slow in coming, and Russia's largest lender, the state-controlled, Sberbank reported on Wednesday that it was going to raise interest rates on retail loans due to the sharp rise in its own borrowing costs. This would seem to be the first major trickle-down from the global financial turmoil onto ordinary Russian citizens, who are already struggling to see the wood from the trees under the impact of double-digit inflation rates. The point about Russia's 15% inflation rate isn't simply the "Alice in Wonderland" quality it has given to Russia's recent growth spurt, what we need to think about is the way in which it distorts all those fundamental day to day decisions which the economy's principal actors (households, companies and the government) need to take. Thus, there is much more to think about in the Russian context than the evident fact that it is a "resource rich country": long term structural distortions which go unattended are never good news. And with 32 percent of the retail lending market, Sberbank's move will have a rapid impact on millions of ordinary Russians - since interest rates on loans are set to rise by anything between 0.25-2.25 percentage points, depending on the type of loan, and the quality of the collateral offered as guarantee. And, of course, the other consumer banks are all set to follow Sberbank's lead in adjusting their lending conditions. Sberbank is reported to be in the process of securing a $1.2 billion loan which will be 40 basis points more expensive than its last syndicated loan - a $750 million credit taken out in December 2007, before the impact of the credit crunch was really felt. Sberbank has said it will start passing these extra costs on to new customers immediately, while loan agreements that have already been signed will remain unchanged. Hardest hit will be rates on mortgage loans taken out in roubles, which will increase by 1.25-2.25 percentage points, while rates for mortgages in foreign currencies will go up between 0.75-1.75 percentage points. Thus interest charged on these loans will rise to between 12.75 and 15.5 percent, depending on the type of collateral and other factors. Interest on other consumer loans - such as cash loans or for consumer durables - will be up by an estimated 1 percentage point on average. And the trickle-down on loans is rapidly becoming a torrent on the mortgages front. One of the first casualties here would seem to be Moscow's decade-long building boom as the sharp rise in interest rates squeezes developers in what has suddenly become the world's third most expensive property market - bettered only by Monaco and London, according to Global Property Guide. The case of the Mirax Group - the Moscow-based company that's building the Federation Tower, which will be Europe's tallest skyscraper when completed - is typical, since Mirax have just had to cancel plans to develop 10 million square meters (108 million square feet) of commercial and residential space after they found that interest rates on some loans had risen to as high as 25 percent. Higher borrowing costs already are hitting demand for apartments, and Moscow-based Real Estate Market Indicators report that prices may fall in the fourth quarter of 2008 and continue falling in 2009. If this happens it will be the first decline in Moscow property prices in 11 years, they say. The property consultants suggest the drop may reach as much as 30 percent for some types of apartments by the end of 2009. This assertion is very hard to judge, but does give some indication of the kind of decline we may see. Prices for homes in Moscow have risen more than sixfold since 2003. In the first six months of 2008 they were up 25 percent, reaching a record average price of 136,404 rubles ($5,318) per square meter, according to data from Metrinfo.ru, a market research company. Since June prices have climbed another 13 percent. And it isn't just in Moscow that the credit crunch is tightening its grip, Russian developers are also cutting apartment prices in the regions as a decline in mortgage lending lowers demand for housing. According to Russia's regional press, sales of new apartments in Rostov-on-Don are down 40 percent this month from August, while sales in St. Petersburg have fallen by half since the spring. Prices are said to have declined as much as 24 percent as a result. And the investment analysts are hitting Russian real estate hard. JPMorgan advised investors, in a research note this week, to "steer clear'' of Russian real-estate stocks since the Russian property sector is expected to be one of the "hardest hit'' in a global recession, while Unicredit analysts state that "The current situation in Moscow partly resembles Japan's real-estate crisis of the 1990s" - personally I think that this is altogether the wrong comparison, but it does give some idea of the seriousness of the situation. Russia's builders have also started to take a beating. Shares of Sistema-Hals, the property company owned by billionaire Vladimir Yevtushenkov, dropped 25 percent to 75 cents at one point in London trading on Wednesday, touching their lowest level since shares began trading in November 2006, while PIK, the Russian developer with the highest market cap, has lost 78 percent of its value since going ahead with an initial public offering in June 2007. OAO Open Investment, Russia's second-largest publicly traded property company, has declined 52 percent this year. LSR Group, the Russian developer and building-materials maker controlled by billionaire Andrei Molchanov, has fallen 64 percent. "The Federation Tower, which is due to be completed by the company in 2010, will be 506 meters (1,660 feet) tall and will replace Commerzbank AG's headquarters in Frankfurt as Europe's tallest building". And this, we may like to ask ourselves, will be a monument to what, exactly? In another sign of the way in which the global credit strains are now biting, OAO Russian Railways, Russia's state owned rail monopoly, has said it is going to "hold off'' on selling $7 billion of 30-year bonds due to the turmoil in global financial markets. The company had planned to sell $600 million of Eurobonds by the end of 2008 to finance an upgrade in what is effectively the world's longest rail network. ING Groep NV, Barclays Capital and Morgan Stanley, the financial advisers on the loan, recommended waiting to sell the Eurobonds after they saw investor interest waning while the cost of borrowing surged. The impression that all this creates is that the global wholesale money markets are now firmly, but politely, closing their doors in Russia's face. Back in July, Prime Minister Vladimir Putin was busying himself advocating a $525 billion overhaul of Russia's railway system, lauding the rail network as "one of the foundations of Russia's political, social, economic and cultural unity.'' Now, wasn't it Lenin who once said that Russian socialism was nationalisation plus electricity, well Vladimir Putin seems to be suggesting that the new Russian capitalism is lots of public money to support the price of Russian equities plus railways, or words to that effect. In fact the sad reality is, after all those ambitious words have been spoken and forgotten, that the current credit crunch will probably lead OAO Russian railways to reduce spending both this year and next (and after that we'll see), both delaying and reducing the scope of the principal projected projects. Of course, the Russian govenment could fund some of the activity itself from the National Wealth Fund, but wouldn't that be just the kind of activity which S&P's are warning about? At the present time Russian Railways claim to have sufficient funds to pay off their current debt and state that they won't need to tap the state-run development bank VEB for refinancing. The rail operator does, however, have 128 billion rubles of loans and bonds outstanding, including 16 billion rubles worth due next year according to estimates, so the validity and realism of their recent statements looks like it is about to be tested. Moody's Investors Service rates Russian Railways A3, the fourth-lowest investment grade level, while Standard & Poor's rates it one step lower at BBB+. Obviously the credit crunch and construction slowdown is bound to work its way through to Russia's real economy one of these fine days (as we have already seen in places like Spain and the Baltics), and one early warning sign on this front could be considered to be the recent evolution in Russian industrial output. 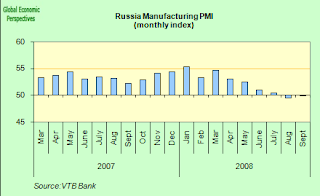 In fact Russian manufacturing shrank for a second month in September, and in so doing registered its first back-to-back contraction since November 1998, as companies cut jobs and growth in new orders slowed, according to the latest VTB Bank Europe Purchasing Managers Report. The PMI came in at a seasonally adjusted 49.8, compared with 49.4 in August. The August reading was the lowest figure in three and a half years, according to the bank statement. On such indexes a figure above 50 indicates growth while one below 50 indicates a contraction. Russia's economic growth is obviously slowing quite quickly - and evidently far more rapidly than the government anticipated - largely due to the impact of the global credit crunch, the downward movement in oil prices and investor reaction to Russia's "go it alone" attitude in international disputes. In the present environment inflation is likely to slow quite rapidly, and in September this easing in infaltion was noted in the prices that manufacturers pay and charge, as highlighted in the VTB report: "The rate of increase in prices charged by Russian manufacturers eased for the fifth straight month to its weakest' since at least January 2003". And just to cap it all, Russia's oil production also fell in September as companies struggled with costs and maturing fields, effectively bringing the world's second-largest crude exporter closer to its first annual drop in output since 1998. Production fell to 9.83 million barrels of crude a day (40.2 million metric tons a month), 0.4 percent less than a year earlier, according to figures released by the Energy Ministry's CDU-TEK unit. Well, in broad outline I don't think the outlook has changed that much from when I wrote my last analysis two weeks ago. As I said at that point, Russia is hardly the Baltics, so we should not expect the economy to go into a complete nosedive. A lot depends on the view you take about the future of energy prices. While the global economy is now evidently set to slow considerably - in addition to the reduction in growth rates already seen so far this year -and especially in the aftermath of the most recent bout of financial turmoil. Cleary oil prices are set to drop even further - and this will only keep pushing Russian growth down - but at some point the market will find a floor, possibly in the region of $80 a barrel. More importantly when it comes to the future of oil prices, I would not be banking on some kind of long and deep global recession. Many of those developed economies who are significantly affected by the bursting of their construction booms (and the banking issues which have gone with it) will probably have weak domestic consumer demand for some time to come, but a solid core of emerging economies may well take off again quite rapidly as we move into 2009 -and especially if energy prices drop back, and the current near panic in the financial markets settles down (people do, after all, have to put their money somewhere). So the emergent (and numerous in population terms) emerging economies should give another strong shove to what may have become a rather listless global economy. As a knock on effect this should also serve to put some life back into export dependent economies like Germany and Japan (who by and large are not reeling under the impact of the construction bust, although their banks may have been lending to people who are).